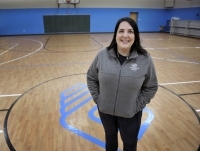 Jackalyn Fehrenbach, a Boys & Girls Clubs of Cleveland (BGCC) staff member for eight years, has been named the new director of Heights Youth Club (HYC) in Cleveland Heights—the organization where her career began. HYC is currently the only BGCC affiliate, of 15 clubs, located outside the city of Cleveland. Fehrenbach, a 2004 graduate of the University of Toledo who is currently working on her master’s degree at Malone University, started her BGCC career at HYC, then moved on to Saint Luke’s Club in Cleveland when that location opened in 2013. Most recently, she served as director there. Fehrenbach replaces Beverly Burgess, who left the organization for another position. The change comes as the funding model for the Cleveland Heights club is changing. Under the new model, parents will pay rates between $15 and $60 per week, based on a sliding income scale, for afterschool programming. This includes supervision by professional youth development staff, daily meals, transportation from some schools, homework help, arts and music opportunities, and athletics. HYC is currently accepting a limited number of new youth members. For more information, contact Fehrenbach at 216-321-2582 or jfehrenbach@clevekids.org. HYC, located in a former church across from Heights High, has been a hub of activity for Heights kids since it opened in 2007. Its members range in age from 6 to 18. In addition to activities and programming, HYC served approximately 20,000 free meals to members last year. Ken Wood is a former Sun News writer and Suburban Journalist of the Year for the U.S. and Canada. He is communications director for Boys & Girls Clubs of Cleveland.